The Quaker Oats guy has long been a part of my life. You know who I mean: the smiling smooth-faced man with two huge plumes of white hair framing his face under a broad-brimmed black hat. As a child, I would see him beaming down at me from his place on the canister of rolled oats as I ate my breakfast. 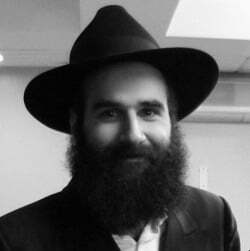 With his black hat and locks of luxuriant hair, he looked like a chassidic Jew with a hat and bushy payos who had somehow lost his beard. The other day, A insisted that she wanted “boy cereal.” After bringing down all the boxes from the top shelf of the pantry to see which one was “boy cereal,” I discovered that it was none other than the box bearing the beaming face of my old friend, the Quaker Oats man. 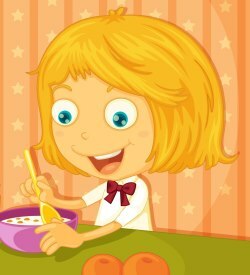 Whatever the cereal is, they both agree that the appropriate blessing to be said before eating it is mezonot—and that is what counts. Amen! The other day, I took A with me to synagogue services. It was one of those long afternoons. I was working at home, and she needed a little time out. So we put on her puffy coat, hat, scarf and gloves, and dashed out the door together. She spent most of the time sitting on my lap or in the chair next to me, and was quiet as a mouse, taking it all in. From then on whenever I mention that I need to pray minchah (afternoon services), she immediately perks up and starts begging to come along in clumsily constructed sentences that only two-year-olds (and immigrants 70 years their senior) can come up with. “Me . . . coming . . . minchah,” her intense brown eyes plead. On one hand, the toddlers are too little to really get what is going on, and chances are they will end up disturbing someone for at least some of the time. Prayer is a time for solemn concentration, and messy kids with bags of carrot sticks don’t fit gracefully into the picture. People arguing this side of the issue have lots of handy quotes from Jewish law to support them. On the other hand, if they don’t go to shul (synagogue) as kids, when do we expect them to suddenly become comfortable in what we hope will become their second home? Also, how can you possibly look askance at a toddler jumping up and down with unbridled excitement at the sight of the Torah being brought from the ark to the reading table? We are not talking about out-of-control wildcats. These are well-behaved children who sometimes get bored or temporarily forget to use library voices. So, after a serious talking-to about appropriate shul behavior, I take them. I have, however, drawn the line at one child. 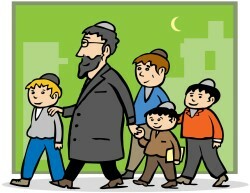 I do not go alone to shul with two or three kids in tow. When they learn to read and pray on their own, we can revisit. But for now, we have a one-child policy. So, if you happen to see me in shul trying to shush my child, or if my kid is running a bit too fast down the aisle, please look kindly. I did not just thoughtlessly take them without thinking about your devotion. I took them thinking about their devotion. You may have been wondering why I have not written for the past month. No, it’s not because the kids stopped saying cute things; nor have I lost the desire to keep you in the loop. So, what has driven a wedge between me and the laptop? The answer is that we’ve been spending chunks of the past five weeks shuttling between our home and the hospital. Thank G‑d, we are all well, and I hope the crisis has passed. I will spare you the details of what went wrong, but trust me when I say that I have learned a lot more about hospitals and emergency rooms than I care to remember. Our neighbors have been amazing. You know the stereotypical image of the tight-knit community where everyone is involved in everyone’s business? Well, it’s true, and it’s amazing. How can you even find the words to thank the mother of a large brood who not only coordinated meals for our family for weeks on end, but actually found the time to zip across the street late Friday afternoon to hand-deliver a mini-vase with flowers for our Shabbat table? There was the time I needed to go to the hospital pronto, and someone needed to stay with our sleeping brood. I just opened the door and stood on the porch. Thirty seconds later, there were some teenaged neighbors settling into the living room, and I was off to the hospital. Our friends (many of whom are also neighbors) have been amazing. Some of our close family friends spent hours and hours at the hospital, advocating, encouraging, and just being there. One friend had committed to make supper for us one night. Turns out that she ended up spending the day in the emergency room with her own son. Not only did she still bring a delicious supper to our home, but we ended up eating her chicken and potatoes in the emergency room as well, since she had us in mind when packing supper for her son. Our kids have been amazing. There were the rough moments. Like the time we walked out in the middle of the night, and Mom did not come back until a week later. It was tough, but these little people are tougher. Of course, the harshness of what was going on was softened, since even in our absence they were surrounded by loving and familiar faces. Our kids’ teachers have been amazing. They have been sensitive to our kids’ extra-sensitive state, and really made sure to accommodate us in any way they can. In fact, the lady next door agreed to temporarily admit A into her preschool so that we would have a few crucial hours to take care of things with no kids at home. Some of the younger teachers even went so far as to take our kids out for Sunday outings, so Mom could get some shut-eye and Dad could spend some time at the laptop catching up on missed work. Our community has been amazing. There is a wonderful organization here that delivers fresh, nutritious home-cooked breakfasts to women who just gave birth. They offered to send them to us as well, and they made a huge difference, with my wife starting her day with her favorite treat: FMSE (Food Made by Someone Else). Our health system is somewhat difficult to navigate if you are not raised here—and even if you are, it is no cakewalk. Thank G‑d, we have met some very caring doctors and nurses who were present, concerned and really caring when we needed them most. Truth is, however, that the glue that kept them all together is a Yiddish-accented army of one with a long black frock and payos who knows every doctor and nurse, and would not stop pushing buttons (and twisting arms) until we got the help we needed. This man practically lives in the hospital, helping everyone he comes in contact with, regardless of affiliation. Oh, and I must mention my mother-in-law. She is one of the busiest people I know. She is a principal of one school, a teacher at another, and a counselor at a third organization. Yet she dropped everything and hopped onto a plane to be with us. Thanks, Ima. It has been humbling to be takers for so long. But it sure felt good to see how many people really care about us. Thank G‑d, we had whom to take from. With His help, we hope to be givers again, giving back to the community that has given us so much. P.S. If you read this post and are saying to yourself, “Too bad I don’t have such a loving, caring community,” perish the thought. No, I am not suggesting that you move—although we would love to have you. I am suggesting that you become a mover and shaker in your own community. Start taking an active interest in your neighbors, arrange meals for a neighbor in need, just start doing, and you will be amazed by the ripple effect. This is a blog about life with my wife and three children, who will, with G‑d’s help, grow up and probably be embarrassed by what I write. As of spring 2013, Y is a thoughtful four-year-old who loves books and learning things. R is one year younger and full of energy. A is a sweet little girl who loves her red shoes. T is their ever-capable and loving mother, and I am their dad.